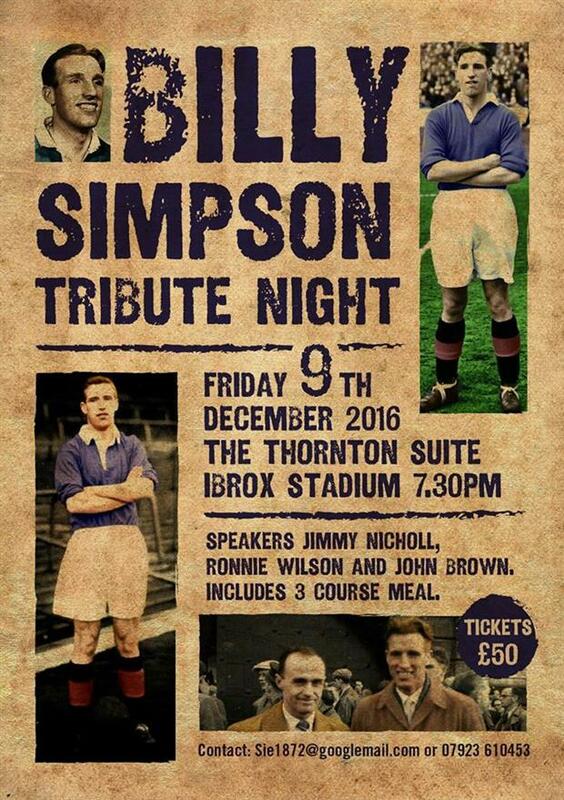 Linfield FC is very pleased to promote the following event in support of one of our Greats. 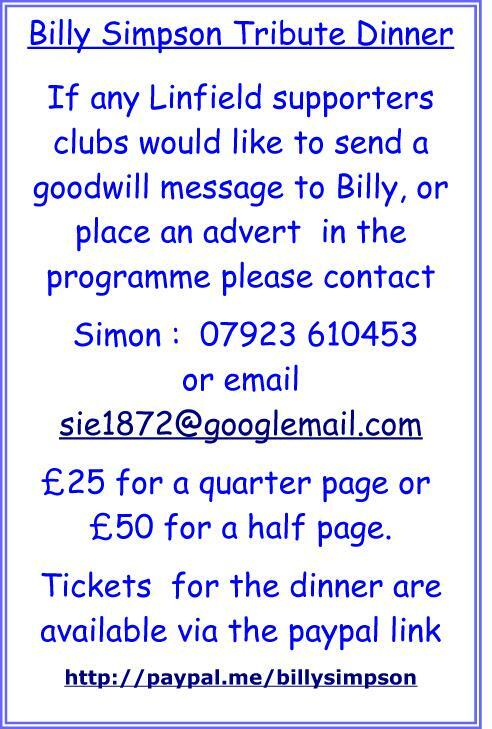 Billy Simpson was born on December 12, 1929 and grew up in the Donegall Rd area close to Windsor Park. He signed for Linfield for season 1946/47 and scored twice on his debut in a 5-0 win against Cliftonville on March 24, 1947. With Linfield he made 143 appearances and scored 93 goals. He picked up Irish Cup winners medals in 1947/48 scoring in a 3-0 win against Coleraine at Celtic Park and again in 1949/50 after a 2-1 win against Distillery at Windsor Park. In 1948/49 he picked up an Ulster cup winners medal and he won a City cup winners medal in 1949/50. In his final game for Linfield he scored in a 5-1 City cup home win against Ballymena on October 14, 1950. He was transferred to Rangers on October 19, 1950 in a £11,500 deal. With Rangers he made 262 appearances and scored 174 goals. He won Scottish League winners medals in 1952/53, 1955/56 and 1956/57 and also won a Scottish cup winners medal in 1952/53. He earned 12 senior caps scoring 5 goals for Northern Ireland between 1951 and 1959 and was included in the 1958 World Cup squad for Sweden. He left Rangers in 1959 for Stirling Albion and then had short spells with Partick and Oxford prior to retirement in 1961. He was also a joiner in Govan shipyard in Glasgow.